I love the story of the strong, driven, successful woman. She so reminds me of the woman I always aspired to be. 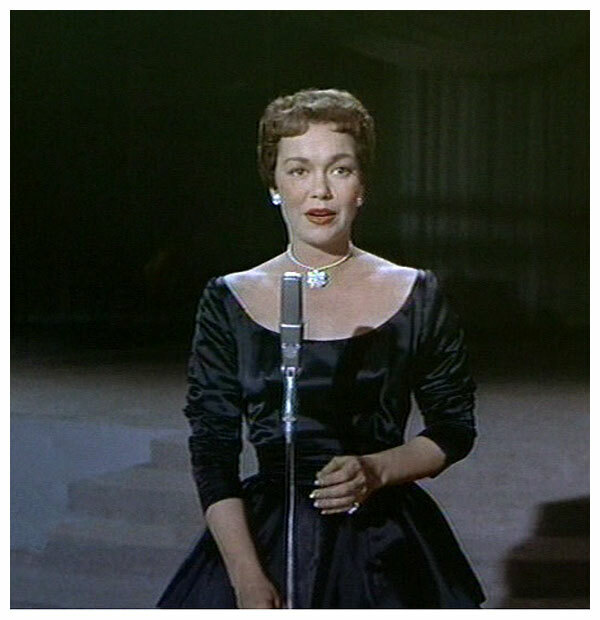 It was such a perfect match between Jane Wyman and Charlton Heston. They really complimented each other. …and the ups and downs of the relationship could fit today’s challenges for a woman who wants to have it all. But what I’ll admit right now is how I loved the clothes!!! Thelma Ritter was a little doll in here. I’m so used to her in her usual matronly-maidish clothes — but seeing her in those Edith Head creations at the end was wonderful. If you liked Giant (1956), then give this film a look. 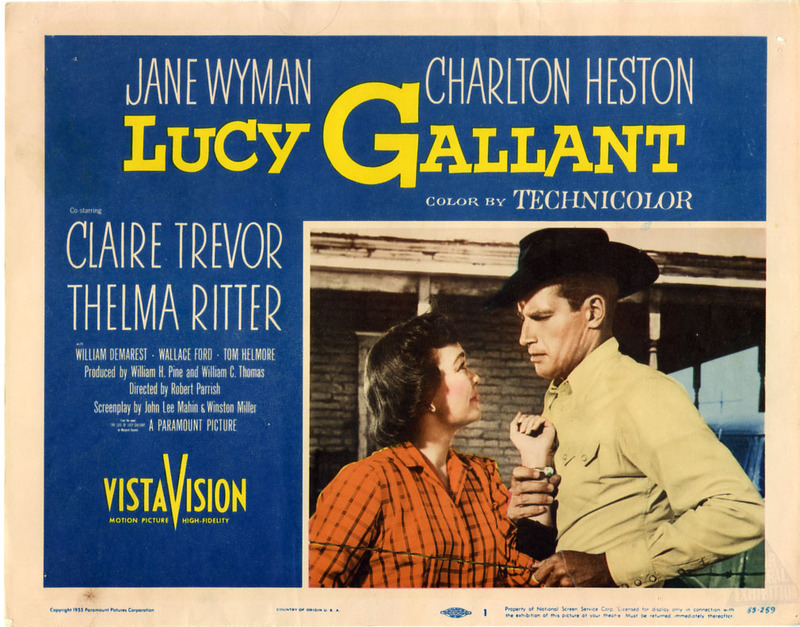 The story centers on Lucy Gallant (Jane Wyman), a fashionable upper-class woman who leaves NYC for a Texas boom town in the ’30s. 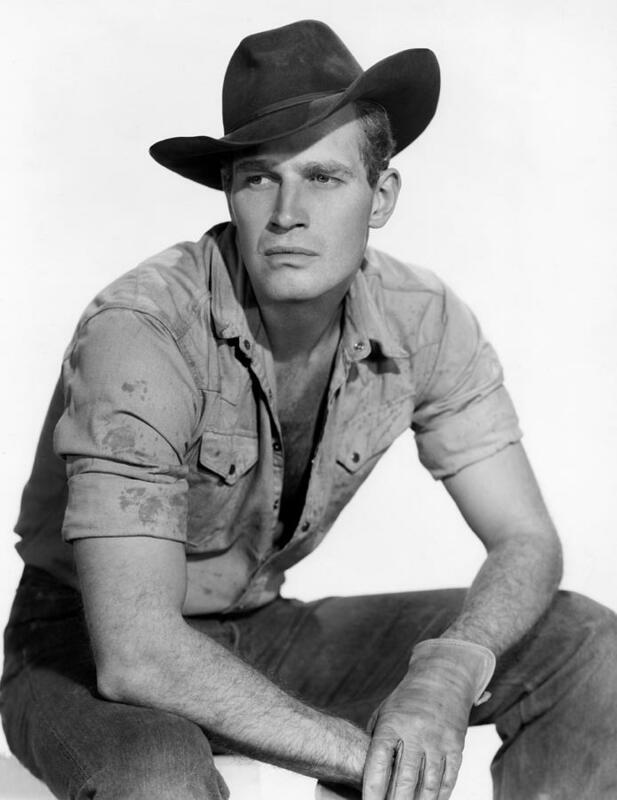 Upon getting off the train, she meets Casey Cole (Charlton Heston), a local cowboy. He carries her over the mud, since her heels are NOT quite suited for this environment. Casey takes a liking to Lucy, even taking her to the boarding house where he sometimes stays while in town; it’s owned by an older friend, Molly (Thelma Ritter- a character actress who’s great in everything), and her husband, Gus. Molly is pleasantly surprised to see Casey w/ such a classy woman. (It’s cool to see Thelma Ritter in some glam clothes later in the film; she usually plays housekeepers.) After settling her in, Casey heads off to his OWN ranch. To get started in business, Lucy sells her wedding trousseau to local women (wives and daughters of men who’ve recently discovered oil). We learn that her father died amid a financial scandal, then her fiancé left her at the altar. Casey is impressed by Lucy’s plans and ambitions, BUT also skeptical (after all, she has NEVER worked before). Lucy is (obviously) attracted to Casey, BUT she keeps him at arm’s length, since her main focus is starting a clothing store. One day, Lucy and Casey have a picnic on his ranch. He’s thinking re: selling his family’s land to a large oil company, then settling down (w/ a wife and kids, of course). Well, Lucy gets the hint, BUT she says that she MUST return to take care of the store. The store gets started on a good footing, thanks to unique inventory, loyal customers, and her long hours of hard work. This is one of those classic films that is still VERY relevant today! Can women “have it all” (career, family, social life, etc)? Why are MANY men intimidated by successful women, esp. those who earn more than themselves? There is good chemistry between Wyman and Heston; their characters are BOTH quite confidant, tough, and stubborn-minded. Will they EVER get together! ?